I purchased Major from a small auction house in December, he had sold to a meat dealer and I literally paid the dealer to rescue Major from that fate. Upon first meeting Major he had severely overgrown hooves, had foundered at one time, was distrustful of humans, had what appeared to be a bullet wound in his abdomen, and had little to no training. He was semi-aggressive, lacked manners, slightly surly, and pushy. 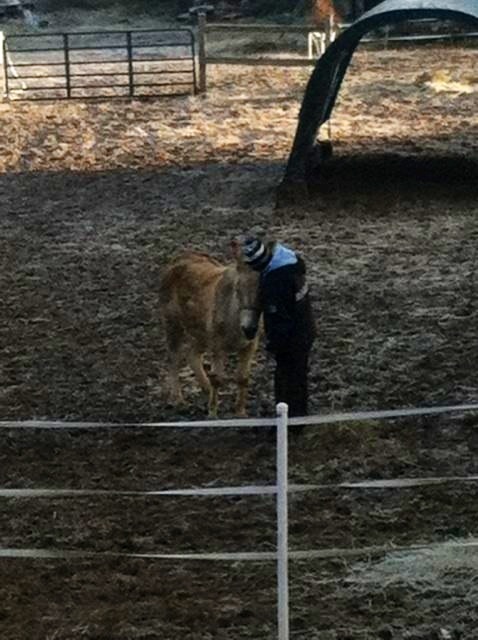 Major did not want to be touched and had a sad look about him. Major the first night at the quarantine (my) farm. Major was quite nervous and brayed quite loudly as the trailer drove away until I came out to ask him what he needed. 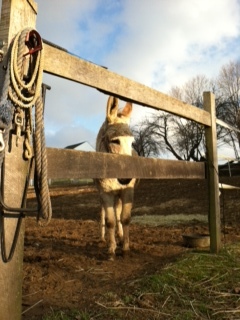 Major’s second full day at the quarantine farm. 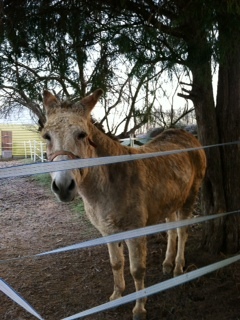 Major is quite territorial and not accepting of many creatures (dogs, cats, other humans) in his quarantine paddock. He aggressively approached the resident dog and cat when they followed me into the paddock. 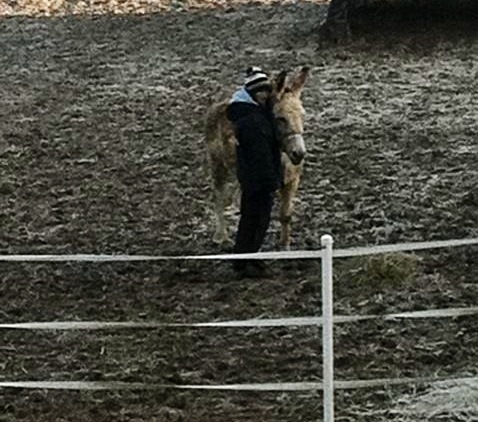 His instincts as a guard donkey definitely are heightened. Major’s first Reiki session. 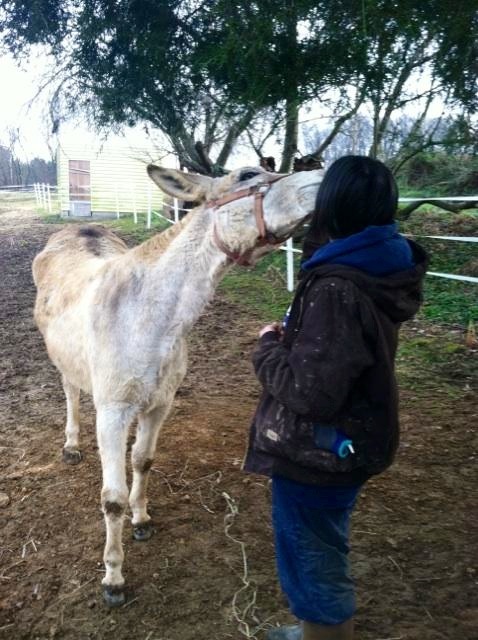 Major readily accepted Reiki and became more amiable to both humans and other creatures in the pen with him. 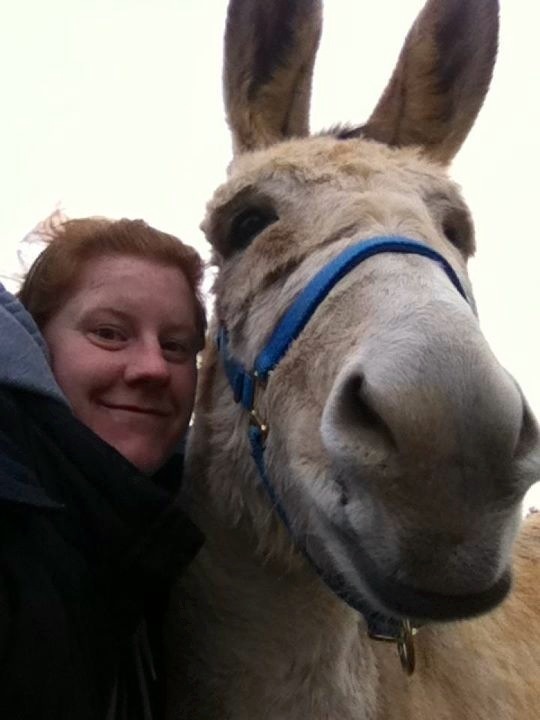 After a few days of Reiki and massage, Major became very affectionate and quite trainable. I was starting to train him to “smile” prior to his new human adopting him. He was very accepting of myself, the resident farm dogs and cats coming into the quarantine paddock and was becoming quite social. Major with his new human. He accepted her right away and she has done whatever suggested and needed both with conventional medicine and integrative medicine to ensure that he is on his way to optimal health. 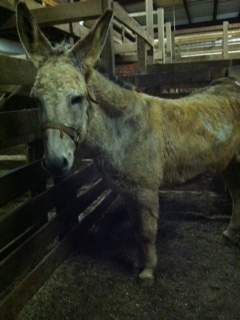 This includes reevaluating his nutritional and dietary needs, bloodwork, hoofcare, dental care, training, and bodywork. 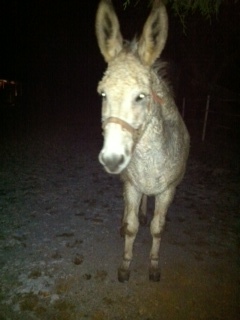 Major after his first bodywork and Essential Oil session at his new home. Physically and emotionally he is becoming much more balanced. He coat is shiny and his overall demeanor is happy. He is still a little pushy and will benefit from more training. 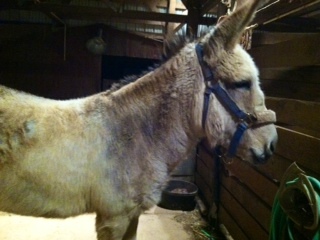 Major in a more recent photo at his new home. Major was a unique and gratifying case. I am fortunate that I am able to chronicle his progress from his initial “rescue” from the auction house to his present (and future) state with his adopted human. 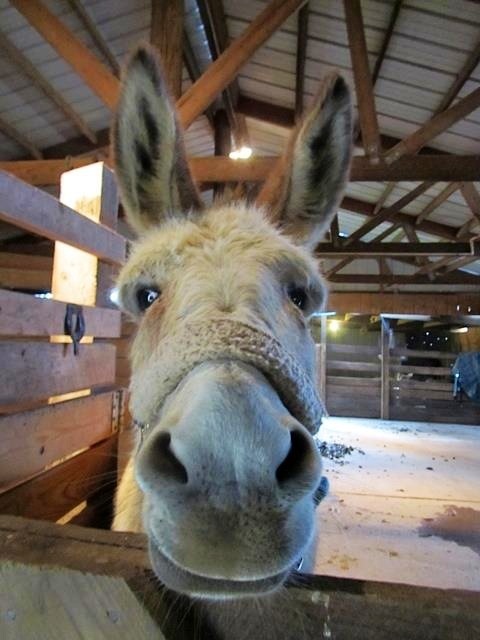 Major came to me initially as a dejected donkey with a multitude of concerns; he was unbalanced both physically and mentally. 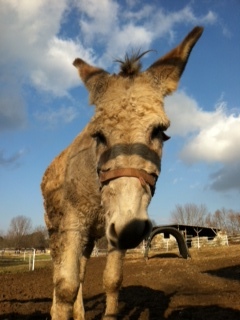 Through both conventional and integrative care he is now the picture of a happy, healthy, young donkey.